Following on from yesterday’s rosé report, today I’ve pulled out four of the best pink wines to pass the desk recently. Four standouts in an ocean of simple, sometimes sweet, sometimes dry, often middling wines. Actually, that’s not fair as there is plenty of good rosé out there, and there is plenty of deliciousness in the category. Just not the volume of really fine wines. These are obviously the exception. A new name to me, but already delivering. This comes from the Patch Vineyard in the Yarra and is whole bunches pressed straight to barrel for wild ferment and malo. Serious! The ripeness here is what carries it over the line, with a ferrous edge and plenty of red fruit. Genuine varietal drive here. Great phenolics and smoky hints; complexity a go-go. Ripe, serious and utterly delicious grown-up rosé. All this for $25? Yes, please. Best drinking: 2017-2019. 18/20, 93/100. 13.5%, $25. Would I buy it? Absolutely. Now this is good rosé. 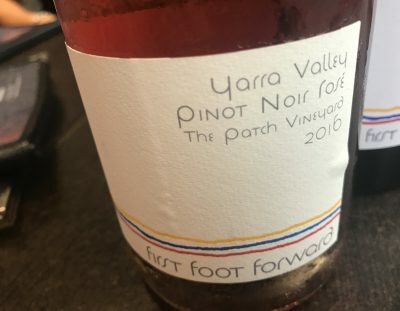 Made by Fran and Shane at Delamere (great spot, nice people), this Tamar Valley sourced Pinot comes off a block set aside for rosé and complemented with some Pinot saignee. Crucially, this has delicate, surprisingly intense strawberry fruit that is nicely balanced by crisp, gentle acidity. That equilibrium between acid/fruit/sweetness is rare, and marks this as a top class rosé. Best drinking: 2017-2018. 17.8/20, 92/100. 12.8%, $25. Would I buy it? Sure would. King Valley sourced Sangiovese rosé. Glad to see a rosado style that actually tastes like it. Full raspberry fruit here with faintly raspy tannins and a real savouriness, lifted by a little pink grapefruit to finish. This is so smashable and lively, yet there is still grip and drive to take this into a more serious space. Good stuff and awfully well-priced. Best drinking: 2017-2018. 17.5/20, 91/100. 12%, $19. Would I buy it? Yes. Grenache based rosé that I believe comes from the extended Yalumba stable. Very light orange pink, this is almost translucent in what you’d call a classic Provençal fashion. The fruit is gentle, the acid trim, the flavours quite pretty and well handled with just a little lolly sweetness on the back. Clever, gentle pink that could almost come with an ‘I love the South of France’ t-shirt. Best drinking: 2017-2018. 17/20, 90/100. 11.5%, $22.50. Would I buy it? A few glasses for sure.